ATLANTA, Georgia, Jan 26 (IPS) – Some 400 activists from Atlanta, Georgia and around the U.S. South gathered for a People’s Movement Assembly Saturday, in solidarity with the Global Day of Action organised under the World Social Forum process. Atlanta hosted the first U.S. Social Forum last summer. This year, the eighth World Social Forum, a meeting place for civil society activists working on a wide range of social and development issues, is being marked with activities in dozens of countries around the world. “Stop building prisons. Start building communities,” “Grady [Hospital] serves everyone! No private corporate control,” and “Stop the Siege on Gaza” were some of the banners displayed on four flatbed trucks, which carried dozens of activists through the streets of Atlanta, while others drove in cars, vans and pickup trucks. As the caravan passed the Atlanta Housing Authority, they were greeted by about 50 homeless people, public housing residents, and advocates, who had just completed an “eviction” of AHA. Activists posted “Writ of Possession” notices on AHA’s doors and signs. 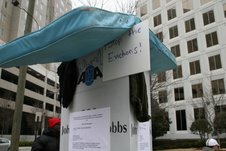 Activists placed mattresses, garbage bags filled with clothes, furniture, lamps, and other items on the grounds of AHA to symbolise the agency’s efforts to demolish all remaining public housing in Atlanta, as previously reported by IPS. “You are hereby notified that you are not in compliance with the basic right to human housing,” the poster stated. “It’s more fun, it’s more interactive and powerful,” Keely Harris, development director of the Metro Atlanta Task Force for the Homeless, said of the action, in comparison to the way protests are usually conducted. “The Task Force is here to evict the Housing Authority for their illegal evictions of public housing residents, [and] violation of federal regulations and due process,” Harris said. The People’s Movement Assembly was not only an event held in conjunction with the Global Day of Action, but also combined two events held every year in Atlanta. “This was a convergence of multiple significant dates and incidences,” Dianne Mathiowetz, of the Atlanta International Action Centre, told IPS. “This is a coalition effort, to bring our issues together and our communities together. We’re connecting reproductive justice to other movements and joining in the Global Day of Action and Poor People’s Day,” Mingus said. Poor People’s Day is another function that has been held annually in Atlanta for 27 years. This year, the event was coordinated with the People’s Movement Assembly. Participants assembled at the International Brotherhood of Electrical Workers building in downtown Atlanta. The caravan then proceeded for about eight miles throughout downtown Atlanta and “going into working-class neighbourhoods where anti-war movements usually don’t come,” Mathiowetz said. The event was organised primarily by Georgia Citizens’ Coalition on Hunger, the Atlanta International Action Centre, Project South, the Georgia Peace and Justice Coalition, and Georgians for Choice. At the centrepiece of the event was a People’s Ballot, distributed by the thousands, for people to select the social and political issues they think should be priorities for the progressive movement. “In the very long, detailed discussion in trying to plan this day, this U.S. is involved in bourgeois elections, so there’s a lot of rhetoric, not a lot of substance dealing with concerned people, [so we decided] instead of voting for candidates, people could vote for issues,” Mathiowetz said. “The [Georgia] State legislature is doing reactionary legislation, like [banning] gay adoption, that’s divisive, miseducates, immobilises, and diverts,” Mathiowetz said. “Poor People’s Day is one time during the year when working people come to the Capitol and say, ‘y’all aren’t doing your job’. This year we decided we’re not going back to [them]. We’re going to the people,” said Emery Wright of Project South. “We had meetings where we discussed what issues [to include]. There was a space on the ballot where people could add… it’s an ongoing ballot,” Mathiowetz said. The U.S. Social Forum last summer culminated in a final day of presentations of resolutions by various groups who participated in the Forum. USSF organiser Alice Lovelace told IPS that those resolutions and proclamations would be advanced by an ongoing ballot process to be developed in the months after the Forum. However, while there was much overlap, the ballots did not flow directly from the USSF resolutions. For example, the Native Americans made a presentation on that day, but they were not involved in the Global Day of Action and no Native American issues appeared on the ballot. “This ballot flows out of Georgia issues and Georgia organisations,” Mathiowetz said. The caravan ended up at the Georgia Citizens’ Coalition on Hunger, where lunch was served while a chorus of children sang uplifting songs, then members of the community made speeches. Shirley Hightower, president of the Bowen Homes public housing residents association, spoke passionately about the plight of public housing residents facing mass evictions and demolitions. “A successful piece of organising. It may not reach the mass media, but it’s important people of the same mind gather together,” said Barry Weinstock, a local activist. “One was to create a community directory in Augusta and Atlanta that will basically start with the homeless community, where you can put up your information and what skills you have and we’ll start to advertise to organisations to create a grassroots community job directory,” Wright said. “One resolution was around increasing community organising skills building, connecting it to NPU’s [Neighborhood Planning Units, official City of Atlanta neighbourhood groups] and neighbourhood planning associations,” Wright said. “They made a resolution around increasing the state minimum wage… Political education for people coming out of the military and coming out of prison… White supremacy and racism workshops with different community organisations that were there,” he said. “Had we had more time, we were hoping to come out with more concrete, specific resolutions. We talked about that more in the closing and how if this was serious we’d have to keep working at it. I said at the end, today would be a beautiful day if nothing comes out of this. But it’s going to depend on the people and organisations that were there to move this forward,” Wright said. The ballots will be distributed until November 2008 and the goal is to reach at least 10,000 residents.